For a soldier, sailor, airman or Marine, reintegrating into civilian life can be a challenge that includes significant barriers to securing and maintaining civilian employment. U.S. military personnel spend four months in training to enter the service and sometimes receive just four days to prepare for civilian life. Thus, many San Diego veterans lack the support needed to adjust to civilian life. 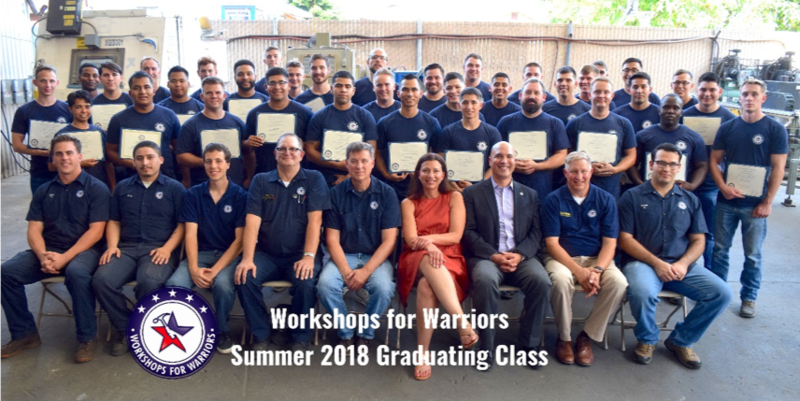 Workshops for Warriors (WFW) was founded in 2008 by Hernán Luis y Prado, a 15-year United States Navy Officer, because he saw so many veterans and service members struggling to find a clear path back into civilian life. He left the Navy and wanted to provide veterans with training and nationally recognized certifications in advanced manufacturing which leads to profitable careers, extending the tools they need for success and the financial freedom they deserve. Given that only 17 percent of people who do a particular job in the military do that same job after they leave service, it is imperative veterans pick up new skills in order to find a job in the civilian world. WFW provides advanced manufacturing training and job placement assistance to low-income veterans, wounded warriors and transitioning service members. The organization is headquartered in San Diego, California and operates with a $4.5M dollar annual operating budget secured from diverse public and private sources. The organization employs 22 employees who help deliver and support its primary program, the advanced manufacturing training program for young veterans that serves approximately 160 students per year. With less than a week to prepare for this transition back to civilian life, significant barriers are often not addressed prior to service members’ exits. U.S. Census Bureau figures indicate more than 10,000 veterans are currently unemployed and 16,000 are living in poverty. Challenges including difficulty finding employment contribute to a suicide rate twice as high as that of the general population (according to a 2015 study by the National Institute of Mental Health). Advanced manufacturing in San Diego and across the nation is one of the most in-demand industries, but has been experiencing a shortage of skilled workers. For many years, employers have reported a sizable gap between the talent they need to keep growing their businesses and the pool of skilled employees. Over the next decade, this gap will equate to a $32 billion loss to the U.S. economy as manufacturing seeks offshore contracting to continue to grow their businesses. According to the Bureau of Labor Statistics, there are currently 1,321,300 manufacturing jobs in California and an average of 4,400 new job openings in manufacturing every month in 2018. Over the next decade, nearly 3.5 million manufacturing jobs likely need to be filled and the skills gap is expected to result in two million of those jobs going unfilled. When pairing veterans, transitioning service members and wounded warriors looking for meaningful careers after exiting service with advanced manufacturing, it creates a positive outcomes in the lives of veterans and their families and additionally supports a growing advanced manufacturing industry, which enhances the overall economic well-being of the country. With its certification program, WFW is solving two fundamental problems—veteran unemployment and a declining pipeline of skilled manufacturing workers. Students participating in WFW programs get to be a part of a group again after military service, creating camaraderie and pride. Thanks to a White House Champion of Change Award recognition in 2012 for Luis y Prado, WFW was asked to create 103 training facilities across the country (with headquarters remaining in San Diego). Since 2011, more than 532 veterans, transitioning service members, and wounded warriors have graduated with 3,530 nationally recognized credentials in welding and machining. Graduates are now welders, CNC machinists, CNC mill and CNC lathe operators, computer aided Designers, and CNC programmers throughout America. All of them have been placed into positions in the U.S. manufacturing industry, securing annual salaries ranging from $32,000 to $55,000. To learn more about the school and how to support its programs or apply, visit wfw.org.